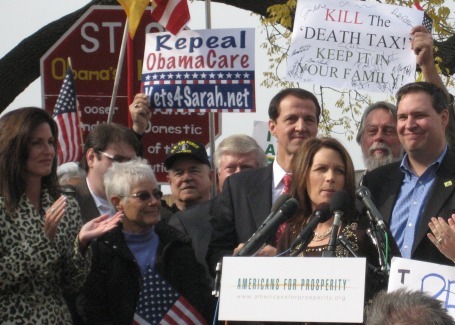 Rep. Michele Bachmann speaks at a rally outside the Capitol Monday. When is an earmark not an earmark? Rep. Michele Bachmann supports a ban on earmarks in Congress, but she thinks that some transportation projects should redefined so they aren’t considered earmarks. Bachmann, along with Minnesota Republican Rep. John Kline, has taken a pledge not to accept earmarks. Bachmann, who did solicit some earmarks when she first came to Congress, has been outspoken in pushing House Republicans to continue an earmark moratorium enacted last year. Senate Republicans also could support a moratorium, after Minority Leader Mitch McConnell reversed his position today and said he backed the ban. They will vote on it this week. Bachmann has not previously discussed changing the definition of earmarks to separate out district transportation projects. The Minnesota Republican said she talked about the idea with Rep. John Mica, in line to take over for Rep. Jim Oberstar as Transportation Committee chairman, about making the distinction. Bachmann, for instance, backs federal support for the Stillwater Lift Bridge, which she blamed the Obama administration for not funding. As Congress returned Monday for its lame duck session, earmarks were among the most contentious issues up for debate.